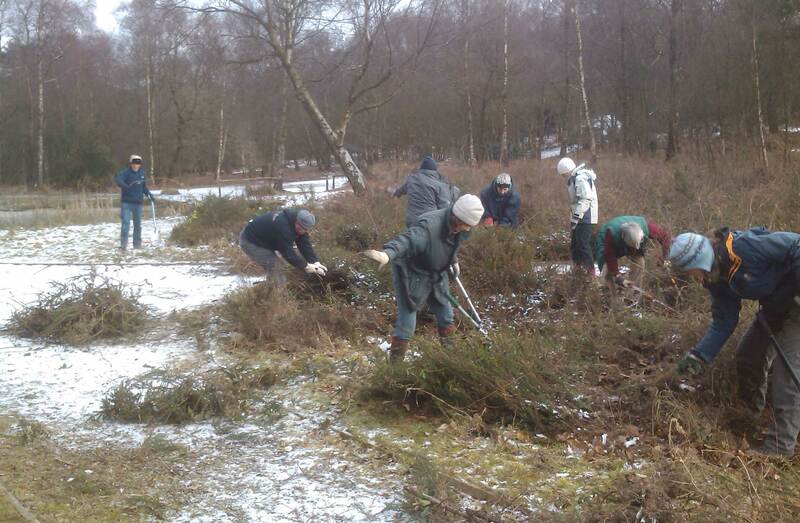 A big thank you to our volunteers who braved the snow to come out on saturday morning. When I arrived in the morning to find it next to impossible to get up the slope into No.1 carpark, due to the ice, I was beginning to think we were being jinxed. This was the third attempt at getting some volunteers together, as the previous occasions we’ve had to postpone because of the snow. Fortunately everyone manged to squeze in around the gate at the bottom. We had a good turn out of 15 helpers, which was perfect as we just managed to get the job done. I wanted to get the area of Heather in the middle of the easy access track cleared of Birch and Gorse. Thanks to Ellie from Sayers Croft who provided the much needed hot drinks and biscuits, and once again a big thanks to our team of volunteers. It was great fun and a good chance to catch up. I’ll keep you all posted by email about the next one. Our Latest Newsletter is out now. If you’re a Friend, you should have recieved your copy either by post or email. Alternatively, Friends can download a copy from the downloads section of our forum on the website.